For virtually every common homeowner complaint about traditional home heating, there's a solution that already exists. Embarking on a major building or remodeling project? Consider hydronic radiant heat. We’re just days away from the start of the holiday season. That means now is the time for good cheer and glad tidings. But if you’re like a lot of people, you’re greeting the coming winter with a grudge. Why? Because the apples ripening and the leaves changing color and the air turning crisp—they all add up to say the same thing: heating season is here again. Oh, joy. Few things infuriate homeowners as much as paying too much for home heating that provides too little in the way of comfort. Yet relatively few actually go so far as to address the situation head-on by replacing the heating system responsible for their frustration year after year. You replace the furnace, sure, but not the central forced-air heating system the furnace belongs to. Of course, it’s no small undertaking to replace a heating system. It’s likely for that reason that homeowners often end up sticking with the aging technology—starting over would be too costly and disruptive. Still, there are at least a few times when homeowners get the chance to choose their own heating system rather than inherit someone else’s choice. You know how a traditional forced-air system works: Warm air blasts through a vent somewhere in the room. Next to the vent, it’s plenty warm—probably too warm. But as you move farther away from the vent, it gets cooler and cooler. So, your comfort at any given time depends on your location relative to the nearest vent. You don’t get consistent comfort from wall to wall, room to room. Why? Because forced air HVAC traffics in warm air, and that warm air rises to the ceiling disperses upon entering the room, inevitably resulting in uneven temperatures. Radiant floor heating operates in an entirely different way. Boiler-heated water travels through tubing set into radiant panels under the floor. The water heats the panels, the panels heat the floor, and the floor heats the room. What does it feel like? 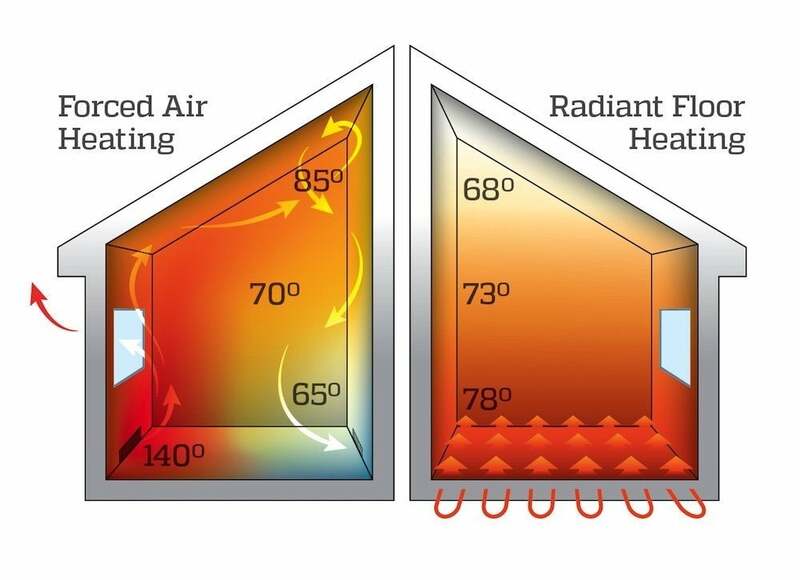 With heat concentrated at floor level, evenly distributed across the entire square footage, radiant heating offers its own unique, qualitatively different experience. Instead of spotty, intermittent warmth, you get constant, enveloping comfort, no matter where you happen to be standing or sitting, no matter what you’re room you’re in, or what floor you’re on. Many homeowners take it for granted that heating costs a small fortune. But while heating your home may never be as cheap as lighting your home, it’s eminently possible to achieve savings. Look no further than radiant heating. 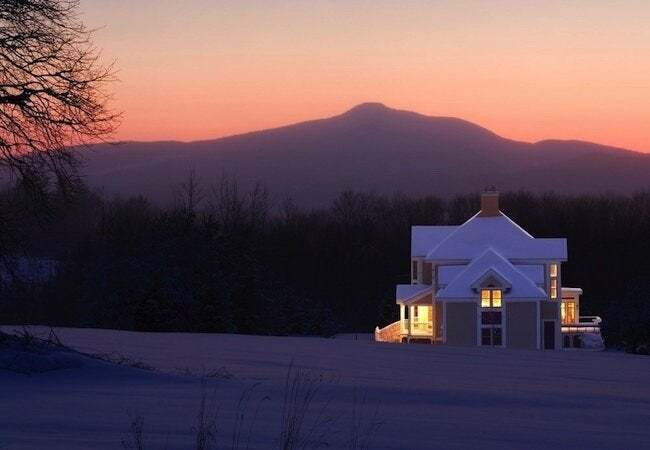 Studies conclude that in comparison to conventional forced air, radiant heat systems operate with much greater efficiency—25% greater, at least. How come? For one thing, chronic leaking in ductwork forces the furnace and its energy-guzzling blower to work overtime to achieve the target temperature setting. The house itself leaks too, with conditioned air often escaping through the gaps around windows and doors. After all, warm air isn’t easily controlled. Those who live in homes heated by forced air often don’t even feel significant portions of the warmth that their energy dollars pay for. In turn, homeowners crank the thermostat up ever higher, only exacerbating the problem. An important point: It’s true that on the fundamental level of design and technology, radiant heating offers efficiency advantages over forced air. But from one radiant heating to the next, there are enormous differences in construction and materials. Those enable some manufacturers to offer exceptional, better-than-rest savings on monthly energy bills. Case in point: Warmboard. 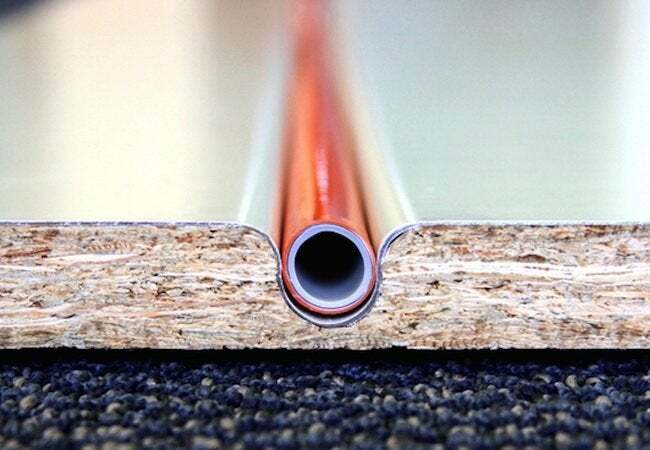 Warmboard faces its radiant panels with aluminum—a material many, many times more conductive than other systems that rely on gypsum concrete or wood to transfer the heat. What’s efficient about high conductivity? It enables Warmboard to heat the home to the target temperature more quickly while using less energy than would be necessary otherwise. For that homeowner, that means, quite simply, lower month-to-month utility bills. Besides better heating delivered more efficiently, radiant also offers day to day quality-of-life benefits. For starters, the technology operates in all but total silence. You don’t hear the system running. (You don’t see it either, because whether installed beneath flooring or set up in the utility room, all system components hide out of view). Try saying that about forced air! Just as important is that radiant heating technology promotes home health, while to a great extent, forced air does the opposite. Because forced air has been so ubiquitous for so long, it’s like we’ve forgotten it’s even possible to be comfortable indoors during winter without having to endure dusty, dry air. But such conditions aren’t inevitable; forced-air heating basically creates them. 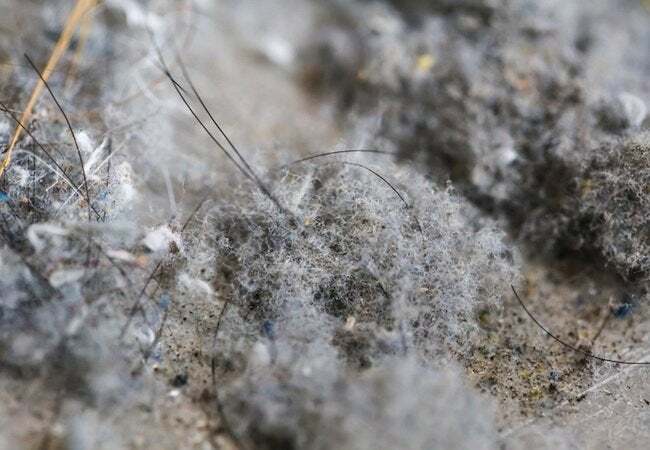 Think about it: Over time, as dust collects in the home, it gradually makes way into the ducts. From there, the dust enters the HVAC system and recirculates through he home, over and over. Maintaining the furnace and its filter helps matters, but only to a degree. Meanwhile, with warm air intermittently blasting into each and every room, the humidity level goes low and stays low. For allergy sufferers—indeed, for anyone concerned with the issue of indoor air quality—radiant heating represents a breath of fresh air. That’s not because the technology comes with a raft of fancy, newfangled health features, but rather simply because its smart design sidesteps ductwork and blown air, two fixtures of forced air that have been causing winter discomfort for years. We didn’t always have better performing, higher efficiency, quieter running and cleaner alternatives to forced air. In fact, 20 years ago, many pros didn’t even consider radiant to be viable for whole-home heating. Since then, in the hands of industry innovators, the technology has only advanced, slowly but surely altering the HVAC landscape for the better, and for good.